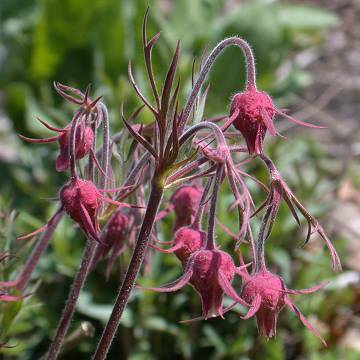 Prairie Smoke (Geum triflorum) | Plants of the Northeastern U.S. Frequently found with Anemone patens wolfgangiana. Also associates with Amorpha canescens, Andropogon scoparius, Anemone cylindrica, Aster ptarmicoides, Aster sericeus, Bouteloua curtipendula, Carex brevior, Carex umbellata, Dodecatheon meadia, Gentiana puberulenta, Heuchera richardsonii, Kuhnia eupatoroides, Liastris aspera, Linum sulcatum, Lithospermum incisum, Panicum oligosanthes scribnerianum, Petalostemum purpureum, Phlox pilosa fuldiga, Solidago rigida, Sporobolus heterolepsis, Viola pedata lineariloba. From the upper Midwest, west to the Dakotas, south to NM and west to the Pacific. Also part of NY state. Herbaceous, subscapose perennial; leaves basal, pinnate compound with many more than 6 gradually reduced, lateral, and toothed or lobed leaflets; calyx campanulate, lobes 5, purple of purple-red, appressed or ascending; petals 5; styles straight, some elongating to more than 1 cm long; seeds bear long, feathery filaments to 2" long. Wetland indicator: UPL in the Chicago area. FAC to FACU in some parts of it's range. One of the first prairie plants to bloom. The flowers are followed by feathery seed heads that look like little puffs of smoke. Native Americans made tea from the roots.